Michael Stamper - Wolf Miners Safety Lamp, When Would It Have Been In Use? 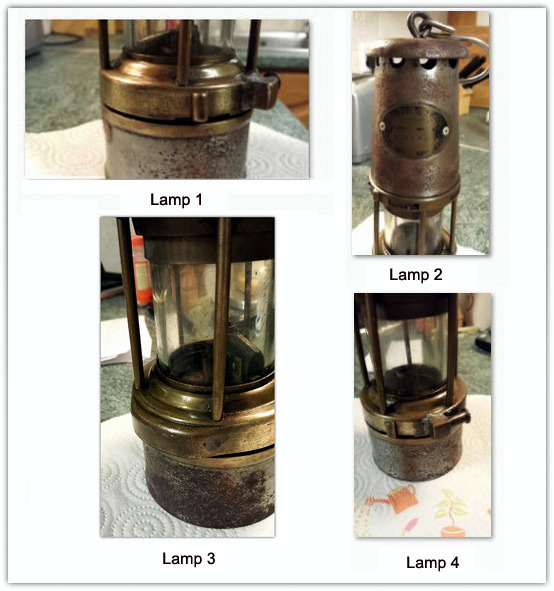 Andy Carroll - What Type Of Lamp Might My Grandfather Have Used In 1914 At Bargoed Or Elliots (New Tredegar) Colliery? 1) There seems to be lots of conflicting advice on the internet as to what fuel to use is it OK to use lighter fuel? Presumably the only drawback of using this fuel is that it evaporates fairly quickly. What’s best!!! 3) What type of locking mechanism was used to prevent un-authorised strip-downs. It would seem that something was used in the mechanism marked by jeweller’s screwdriver. Was it a simple padlock or an official device if so is it still available? I wonder if these lamps had a lead seal (as on a utility meter) to show if the lamp had been tampered with. I had found several vague references to them, but nothing in detail. Family connection with mining was through my father who was a fitter in the 40s/50s at Elsecar Pit (South Yorkshire) before he went on to become an instructor at a NCB Training Centre in Sheffield. While at Elsecar, he was one of the team that renovated the Newcomen (style) pump for the festival of Industry. 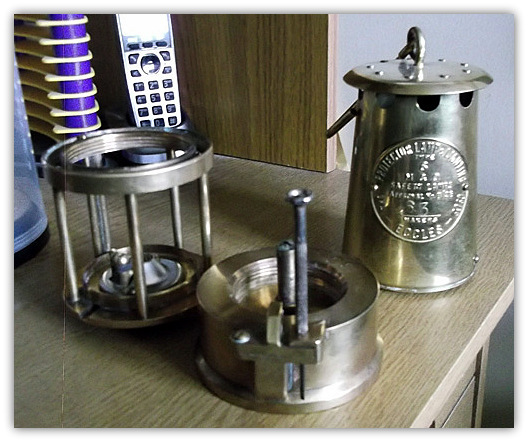 Hi, I am looking for a device or transformer to light a workmans lamp. I belong to the South Derbyshire Mining Preservation Group and we have a display area at Conkers (formally Rawdon Colliery site). We also have a room at THE OLD HALL in Church Greasley. Can you put me in touch with anyone. Fionn passed your email on to me. From your description am I right in assuming that it is a battery lamp with cable and cap lamp? The battery needs to be topped up with distilled water above the battery plates otherwise they tend to buckle and then the battery will not hold a charge. If so what you require is a charging rack. I know that they did have a spare one at Pleasley Colliery Heritage museum site. I don't know what condition it is in providing of course they still have it. This is a closed colliery at Pleasley where one of the two engines originally worked by steam power has been electrified and can be seen working. They may have spare parts to make a simple single charger as I have one myself. Possibly may fix you up if you have something to offer as a swap. The site is 3 miles from Mansfield and 9 miles from Chesterfield. Hi have been given a old miners lamp I think its c1870, I am looking for more details of age and how many made etc, lamp is great have given a bit of a clean. Top of Lamp Marked J Abbot Gateshead. The only other mark is 6 on the oil tank, thanks. Wolf Miners Safety Lamp, When Would It Have Been In Use? I wonder if you can help. I know very little about miners safety lamps, but I have a lamp and wonder if you can tell me (approximately) when it would have been in use until. The lamp says on it "The Wolf Safety Lamp Co (Wm Maurice) Ltd Sheffield - Wolf Type FS". There is also a brass plate on top of the lamp which reads "P.O. 1981". I would be very grateful for this and any other information about this lamp, or similar lamps. 1- Where can I get the smaller flints from for the type 6 and type GR 6S re-lighter lamps and wicks also? 2- What fuel would you use in the lamps? I have seen Ronson lighter fluid and B&Q outdoor lamp oil suggested? Hi my Uncle is over Australia at the moment he has a Davy lamp and is wanting to buy flints. Please could you advise where we could go to purchase. Hi Fiona, Brian Robinson, a Breathing Apparatus and Rescue Consultant, says he uses standard lighter flints that you can get in a tobacconist, or supermarket they are slightly smaller diameter, but work perfectly well. He adds - in case you haven't managed to do it yet, I'll go through it step by step, I'm away from home without a flame lamp but from memory should be ok.
a.. If its a straight type 6, it should not have a magnetic lock holding the base on (where the fuel goes in), unscrew this. c.. once the bar is down, grasp around the glass portion with one hand, bonnet with other hand, and screw anti clockwise until the bonnet comes off. d.. there should be 2 gauzes in the bonnet, a washer on top of the glass (be careful, these washers are asbestos), and simply take the glass upwards. e.. The flint is in the protrusion, this is a screw cap with a spring in it. Unscrew the cap, take out the spring, flint in, spring in, screw cap back on, and reverse the procedure. f.. allow around 2 hours after putting fuel in before trying to light it, Ronson lighter fuel is fine. If you have any problem just email me again and I'll do pictures to help. I have just acquired a Wolf miners lamp in need of some TLC, however I am having trouble how to open this one. Attached some photos. Found your site after a google search. Can you also advise what the metal tube is for on the side. I think to open the lamp it has to be done by a strong magnet. I think it is in the solid part and the tube is something to do with it. I am not sure as I have never seen that design before. I remember when I was doing duties in the lamp room during the strike periods (I was a Surveyor and management) all I did was to hold the lamps where the box weld is and the lamp hinge would open. This would allow the bottom vessel to be unscrewed but with the Protector lamp as you unscrewed it one of the double pillars would drop allowing the top bonnet to be unscrewed. The Wolf lamp is a different design of course and there are only single pillars (bars) equally spaced. I have a Wolf lamp but mine is a slightly different design but very similar. It has a solid brass piece between 2 of the bars and is part of the base and not welded and I assume that is where the magnetic is. However I can open mine and take the lamp to bits by unscrewing the base. It is possible that it has been demagnetised to enable me to do that. However looking at the photographs it looks to me as though yours has been damaged and squashed where the joint is. Have you tried very hard to unscrew the base? They can be tight and a squirt of WD40 sometimes helps. Otherwise failing that, a trip to the National Mining Museum, take the lamp with you and their lamp man could probably help you to open it and explain. What Type Of Lamp Might My Grandfather Have Used In 1914 At Bargoed Or Elliots (New Tredegar) Colliery?